So many people are kind of weirded out when you mention pickled eggs! Simply, they are hard boiled eggs that are cured in a vinegar brine with some added flavors and seasoning. 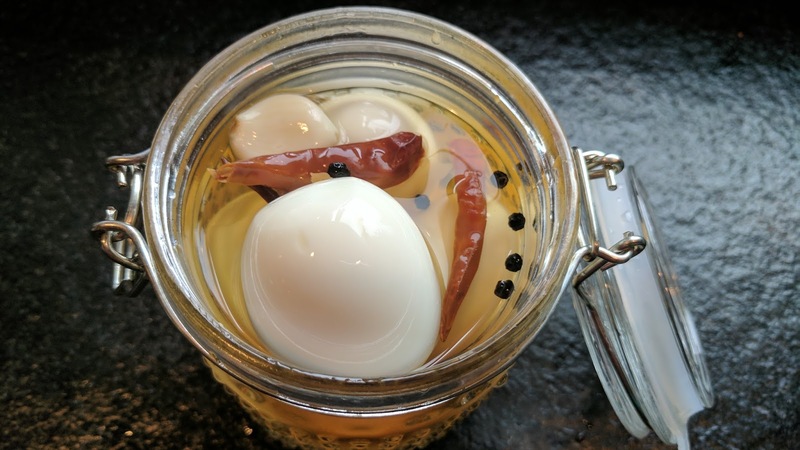 Years ago, you could find pickled eggs as a snack popular in pubs, bars and taverns, in places where beer is served. It's a pretty healthy snack with your beer, I must say. I like them in my work lunch, no beer, but hey, it's a wonderful taste treat! Make the brine in saucepan over medium heat. Cool. 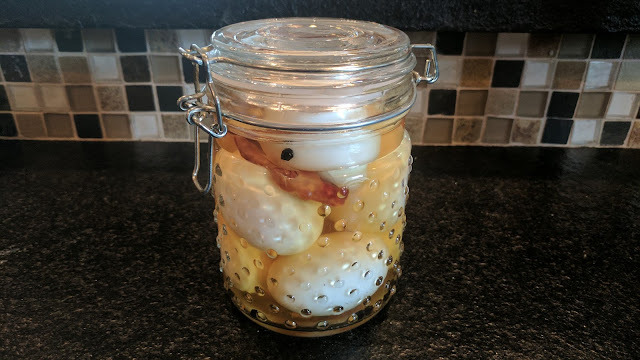 Pour over peeled, hard cooked eggs. 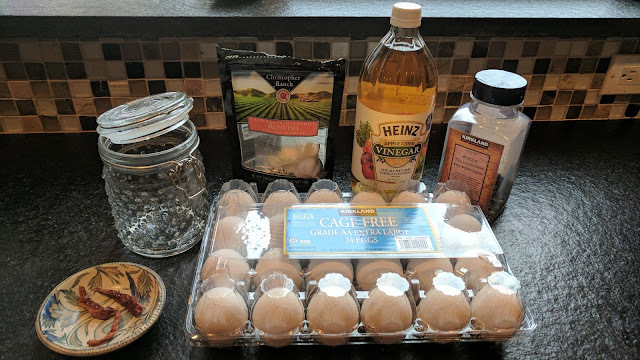 Recipe for perfect hard boiled eggs is here. Add to a jar with a tight fitting lid. Keep chilled in the fridge. These last a long time... and I think they taste best in the 2-4 week range, if they last that long. Seems like everyone has a bottle of Fireball whiskey hanging around. If you haven't tried it, I would recommend you do. It got me thinking, what else could I do with this stuff? Why not barbecue sauce? 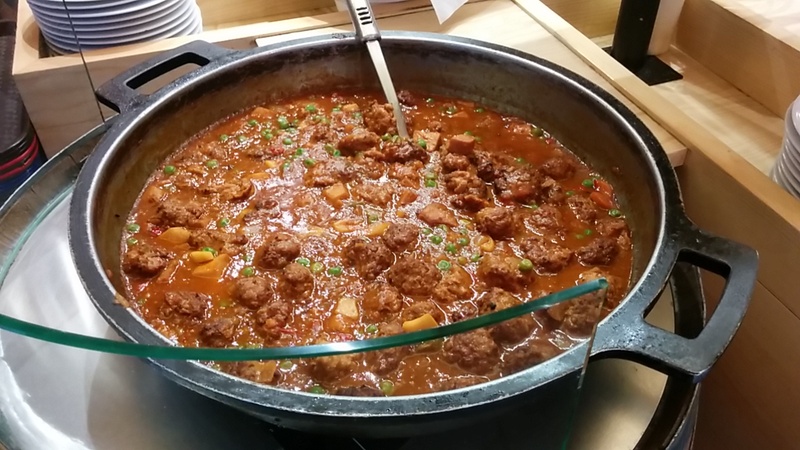 It's sweet, its spicy... Fireball is perfect for it. 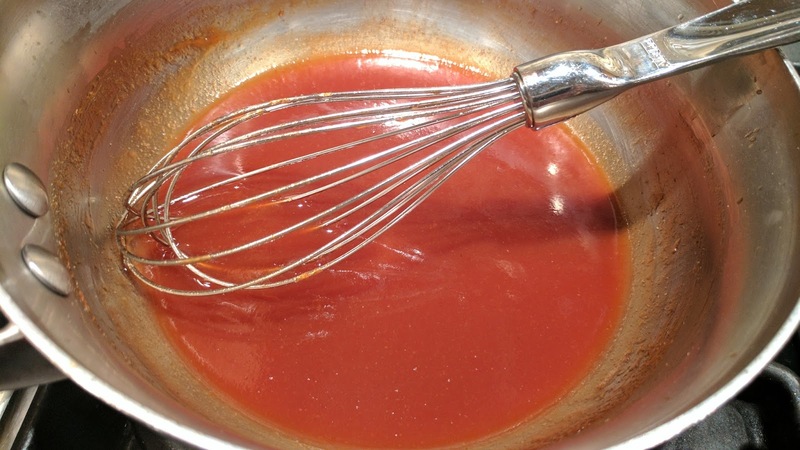 This is a simple throw together sauce, takes 5 minutes. You could use minced fresh onions and garlic... but powdered is so easy in this recipe. This sauce would be equally good on pork, especially Pulled Pork, or beef too. In a saucepan, over medium heat, add the ketchup, the sugar, the vinegar and spices. Cook for a couple minutes to thicken and combine flavors. Add the Fireball and stir to combine. 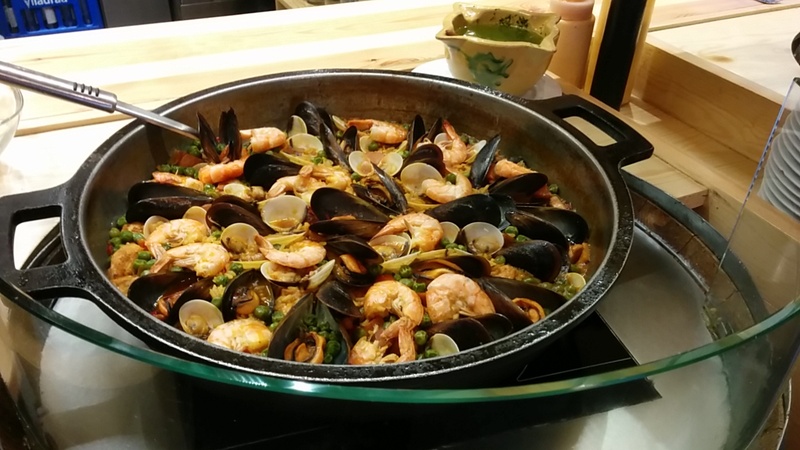 It may be a bit thin for your liking, so you can continue to cook to thicken it back up a bit. 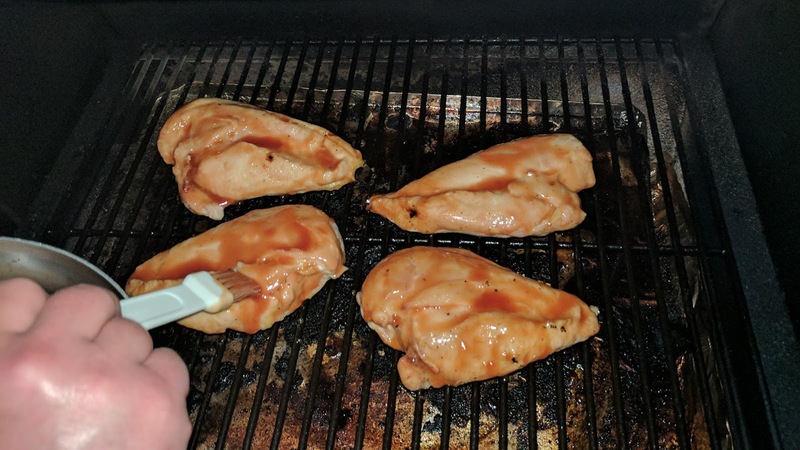 Cook your chicken to your liking on medium hot grill (or smoker). 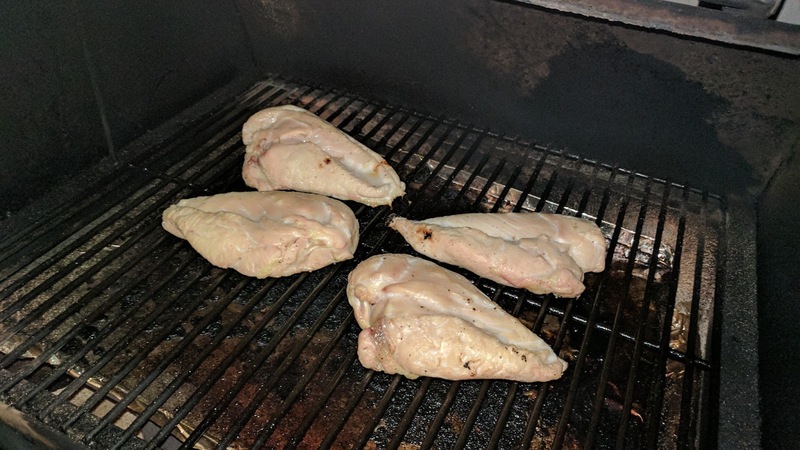 Usually about 5 minutes per side, but it depends on the thickness of your chicken breasts. You want to cook the chicken most of the way, but not completely. You will finish cooking the chicken with the sauce on it. Sorry about the bad pictures.... but it was cold and dark out. We used a smoker, so there aren't any grill marks on the chicken. Brush on the sauce and cook for another 1-2 minutes per side to "set" the sauce on the chicken. Serve with a bit of sauce on the side. This chicken is good cold as leftovers too. 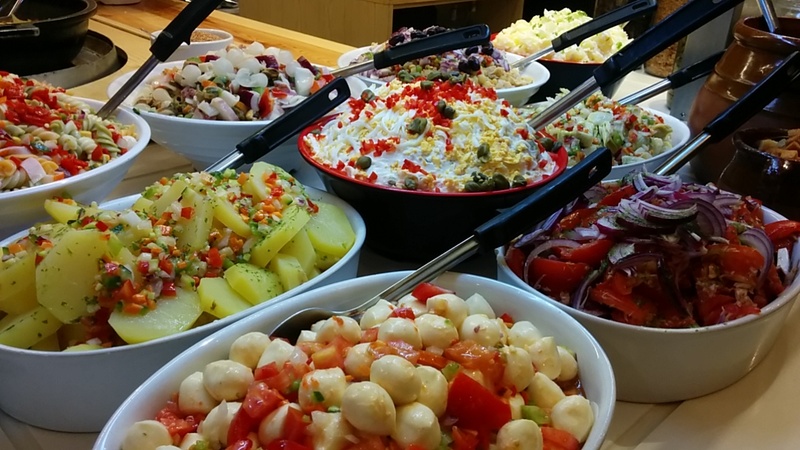 So many little dishes around the world, yummy small plates to share over drinks with friends. What a terrific way to sample a country's cuisine! 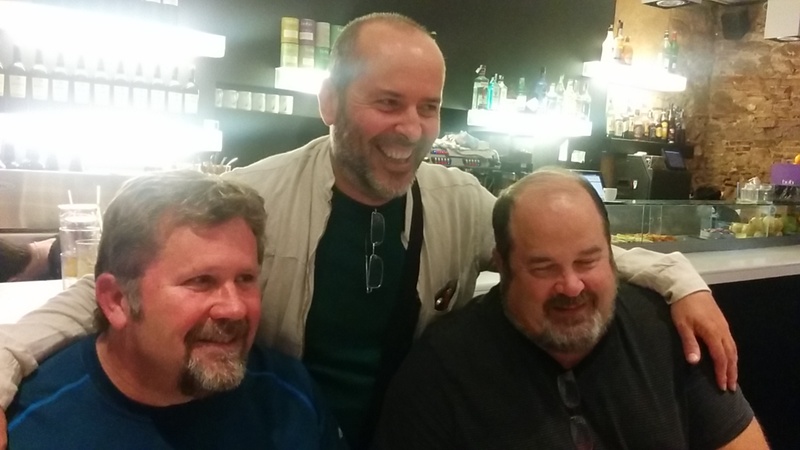 We'd just left Venice and enjoyed cicchetti at a bunch of great places (you can read about that here). 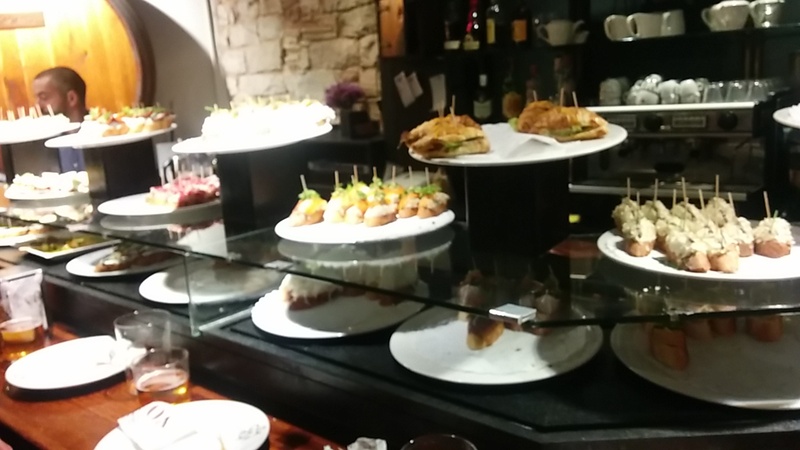 So, as we continued our trip disembarking our cruise ship in Barcelona, we were excited to eat a bunch of tapas too. We spent the morning strolling the city, the "hangries" started to hit about 11:30am. It's important to ensure that group stays amiable when traveling with friends. Lunch was in order, stat! 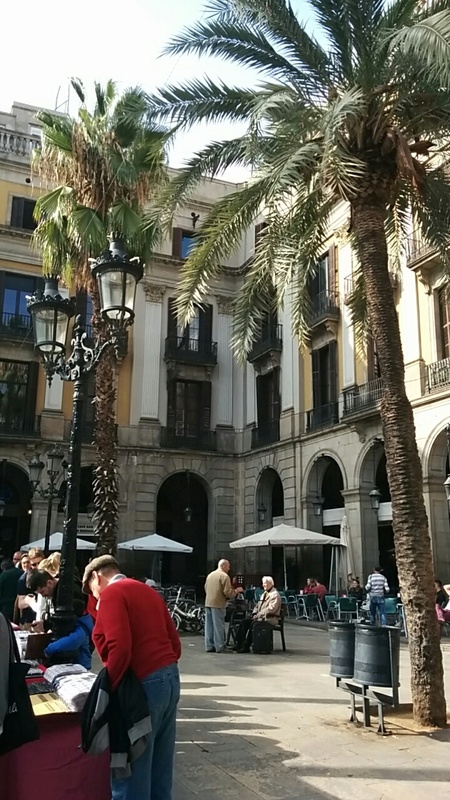 We had walked the Gothic Quarter for hours, it seemed. Looking at all the shops and restaurants. We kept talking about one place that seemed to be some sort of chain restaurant tapas place. It was bright, and open, and just opening for the day when we walked by. 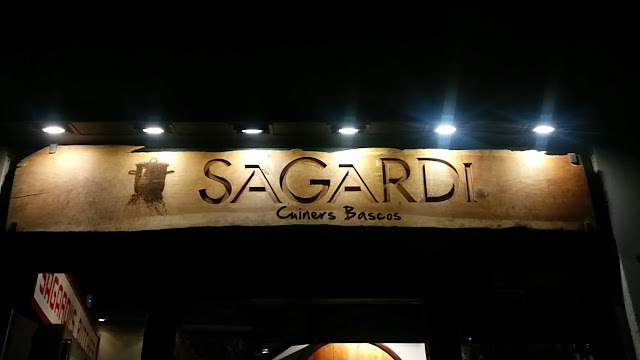 It seemed like a cop-out to go to a chain, but as we wandered the area looking for places to eat, this one really seemed like the best selection, the best price and the easiest for our crowd. 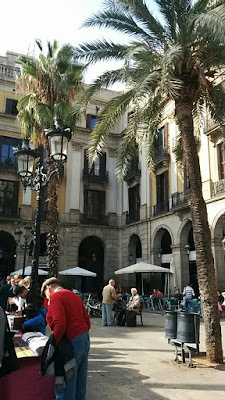 We needed to sit and decompress, we'd had a very busy morning walking miles in the city before Noon. Here's the place. Why yes, we were the first ones through the door. Meatballs in a spicy red sauce. These inspired my recipe here. I cannot remember this one... some sort of meat croquette with a slice of cheese and a pine nut! 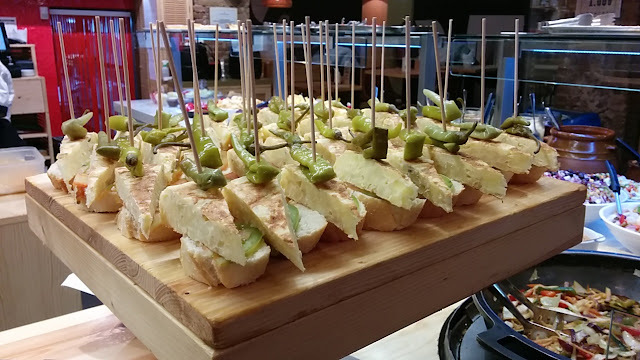 Spanish tortilla (Eggs and potatoes) stacked on bread and speared with a hot pepper. 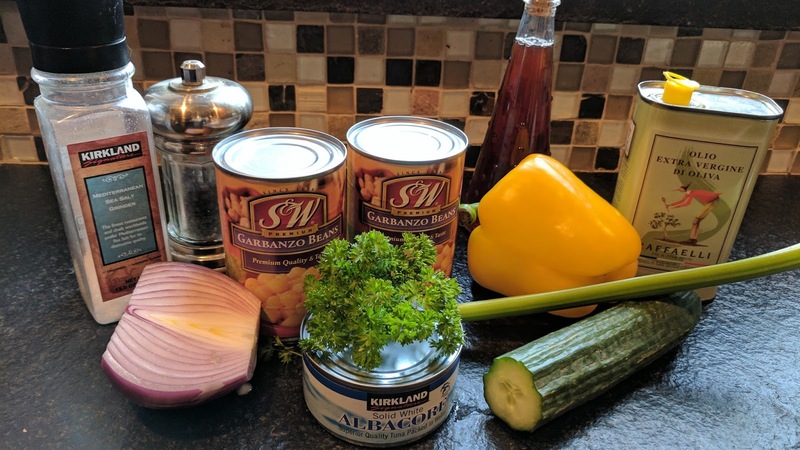 Just barely showing in the far upper right of the photo below is a wonderful tuna and garbanzo bean salad. It was divine, and I intend to recreate it at home. That recipe is here. 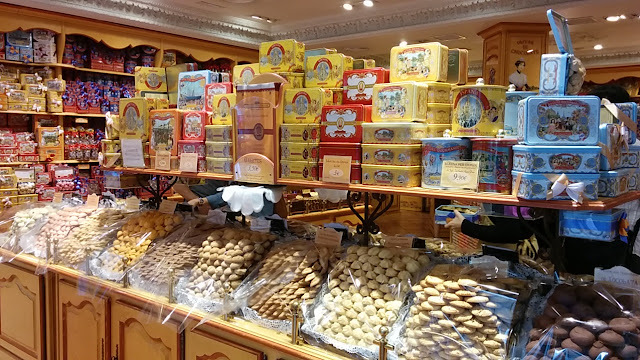 Fun shops of Spanish candies and cookies are everywhere. 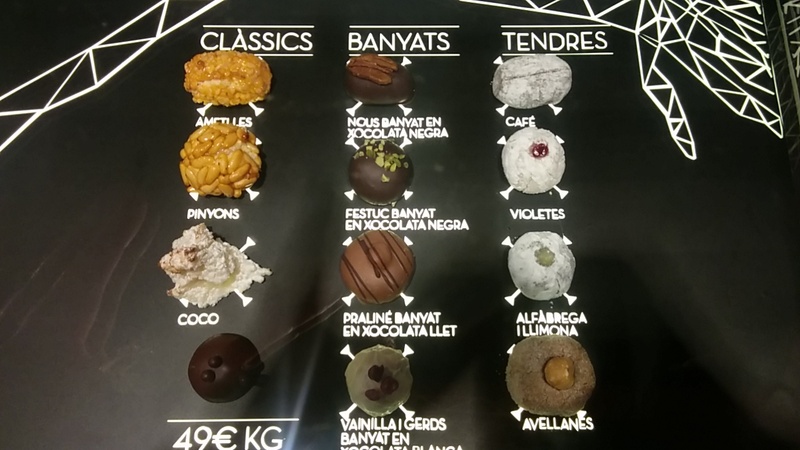 Here's a selection of Catalonian nougats in some many varieties. Cookie Store- These were very expensive and beautiful cookies. 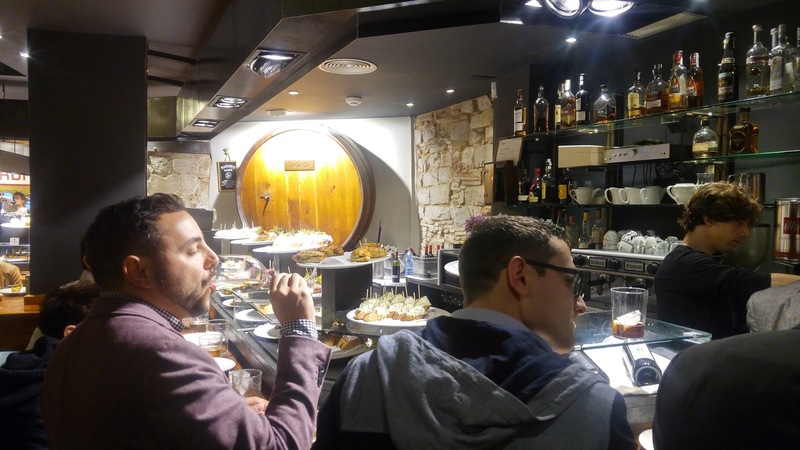 The next night, we'd planned ahead and booked an evening tapas walking tour. It was the six of us, and our guide. We had a blast, nibbling, sipping and learning about the city and great food and wine. 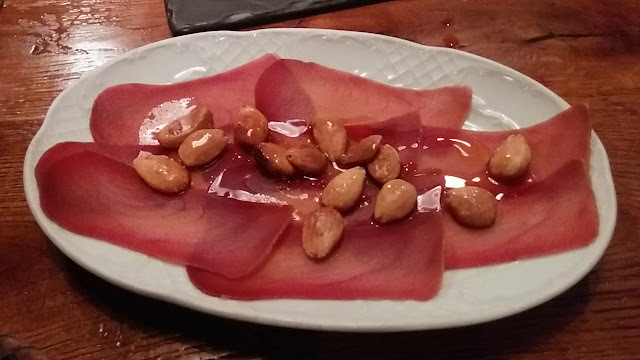 This stuff was amazing... dry cured tuna! Delicious and different, with a drizzle of olive oil and some marcona almonds. It tasted like fresh and light ham, in a way. Potatoes Brava- Spicy sauce, creamy aioli on fried potatoes? Why, YES, what a delightful idea! 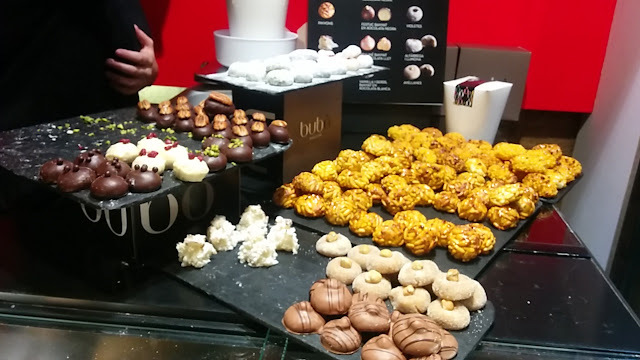 Every place we went had them, and I think we tried them everywhere we went. 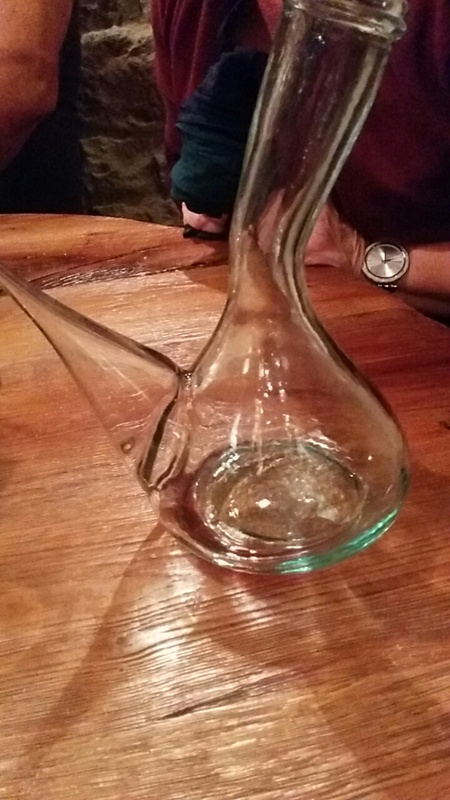 This is a peasant communal wine drinking vessel, it is not any kind of smoking device. There are photos of each of us drinking from this high above our head. Not the prettiest photos, but a lot of fun. This place was our favorite! Interestingly enough, this one is also part of a small chain in Barcelona. This one is in the Gothic district. 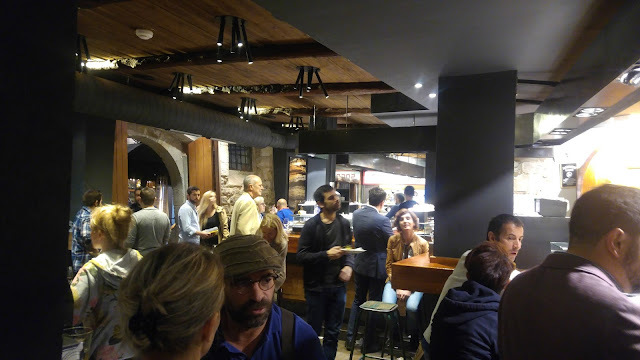 The place was massively busy and the bar was packed with diners, and platters of serve yourself tapas. 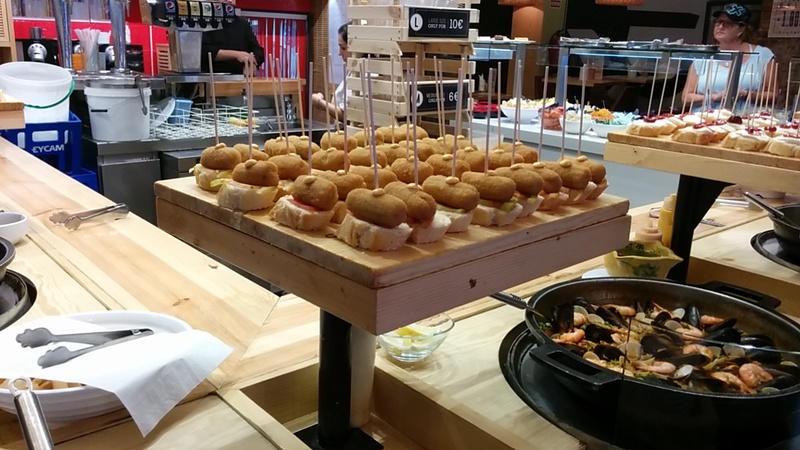 You show your skewers to get charged correctly when you are finished dining, kind of like the stack of plates when dining at a conveyor belt sushi place... It seemed like a nice way to do it. Look for a place to perch, we'd suggest getting one of the stand up bars near the kitchen door. 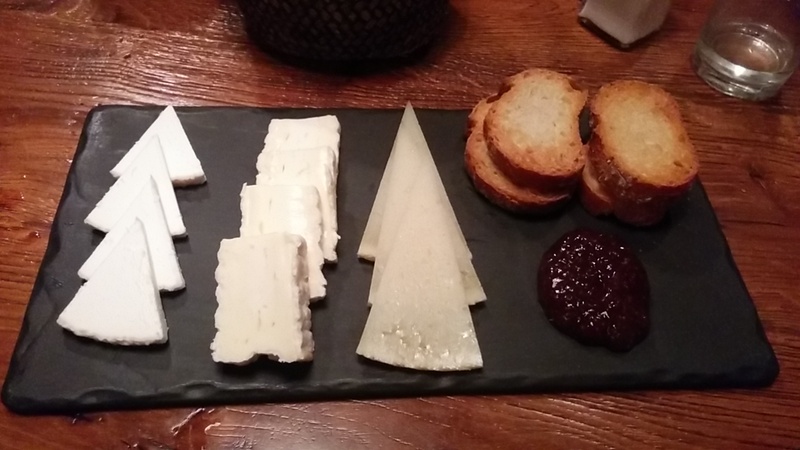 Hahaha, it was a primo spot to get the best selection as the servers came out of the kitchen. 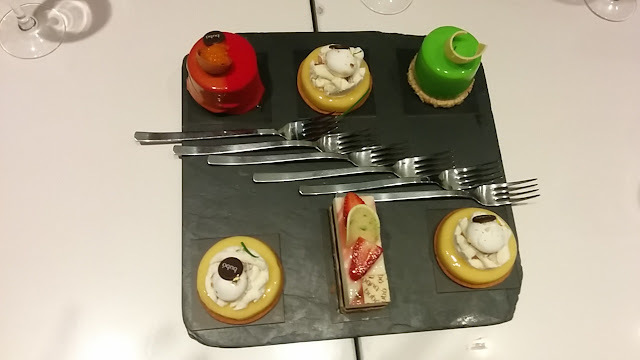 The service here was really nice too. People totally didn't mind when you reached between them to grab a tasty morsel from the platter. A laugh and a smile are always a great way to connect. 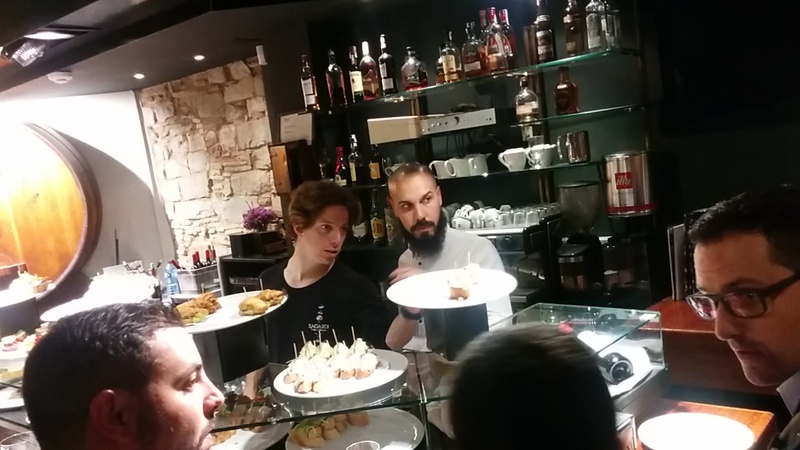 I think the bartenders have their eyes on the hungry tourists in the corner... I promise we are not misbehaving! Hahaha. While it looks like they are charging 49 euros for a kilo of cookies, I am pretty darn sure that it does say 4.9 euros in stead! This was the most beautiful dessert. I chose it because two others of my nearest and dearest buddies chose the lemon dessert before I could speak up! Hahaha, really, I didn't answer as my eyes were stunned by the beauty of this orange and red of this one. Here's the six of our dessert choices, lucky they were small, we were so full! Jorge, our tour guide was so nice and charming. We had a needed stroll back to our hotel to help all this food and drink hit bottom. It was a terrific last day to our European adventure, early the next morning we were off to the airport. A busy day, a hubby caught late at work, a run to Costco in the beginning of the holiday hub bub. Once you're home, you're a bit tired to think a balanced dinner. 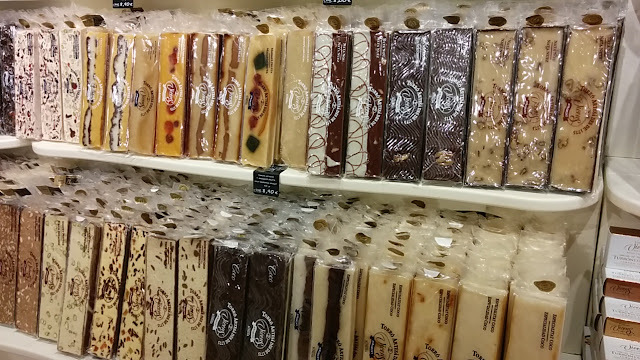 What to make, what to make? I stared at the fridge, trying to get inspired. 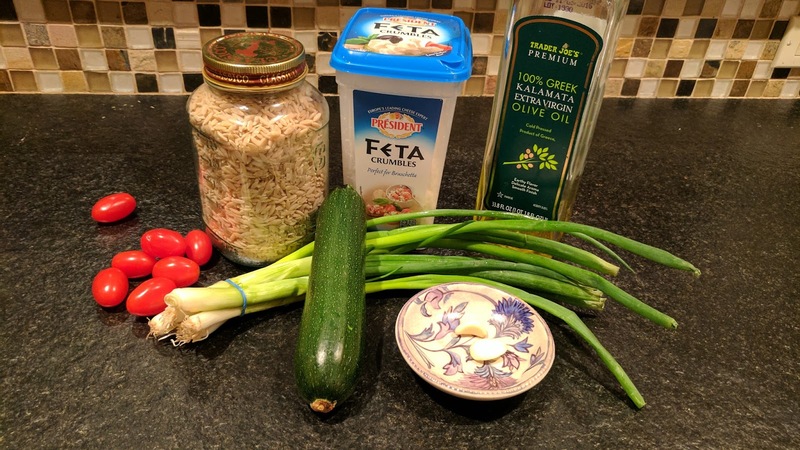 I see an overly large container of feta (my favorite) a lonesome zucchini and some tomatoes. Not enough for a stir fry (which would also be somewhat weird with feta in it...), but hey (! 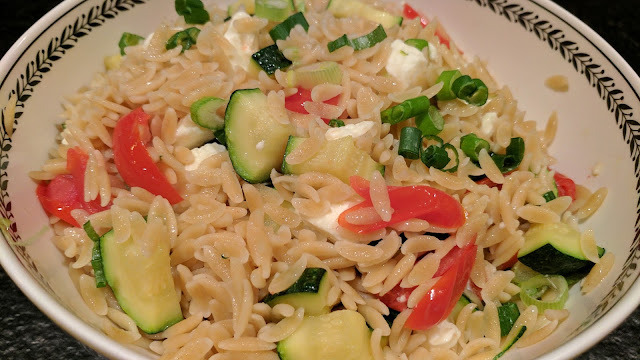 ), what about combining with orzo? Orzo is a small pasta, that is used a lot in Greek dishes. Yum. This one is great for a side dish at dinner one night and then dressed up for lunches too. Tossing the leftovers with a bit of Italian dressing would be a nice past salad lunch. You could throw in some leftover chicken or salmon and it would be tasty too. 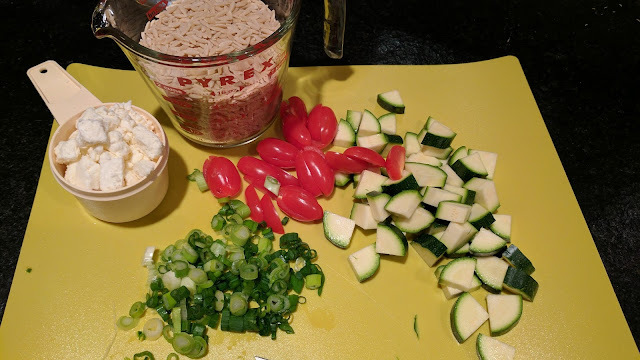 Boil the water, add the salt and the orzo. After about 6 minutes, before the pasta is done, throw in the zucchini, crushed garlic and the tomatoes. Cook for about 2 more minutes, Just enough to soften the zucchini a little bit. Drain. Toss with the green onions and the feta while it is still hot. Add a drizzle of olive oil and add more salt and pepper, if needed. Serve at once, or reheat for lunches. It would be fine at room temperature too. This salad came to be while I was making another salad, the Spanish Chickpea and Tuna salad I posted yesterday. 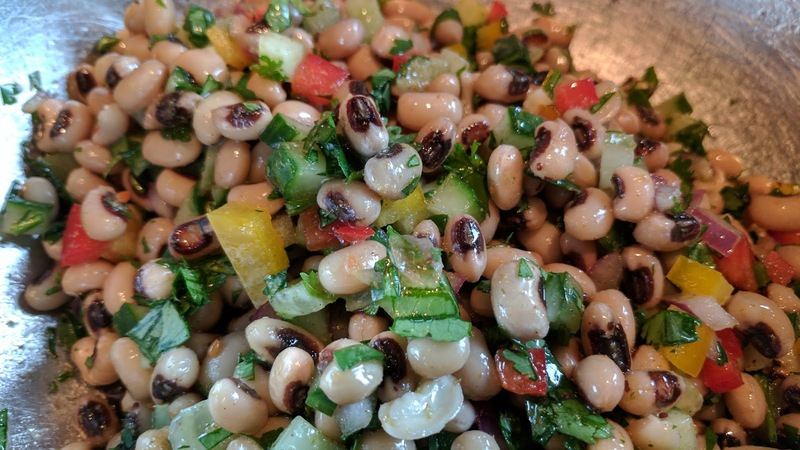 While I was cutting up the veggies, I started thinking of the bag of frozen black eyed peas that I had thawed, that was sitting in the fridge waiting for me to become inspired. I didn't intend to blog this one, but it was so good I had to share. Sorry for the lack of photos here. Making two salads at once it a real time saver, and on a hearty salad like this one, and the one from yesterday, they are good keepers for your lunches, plus they are very healthy! While I used frozen black eyed peas for this, I suggest the canned for this recipe. I think they are a bit more tender and flavorful. 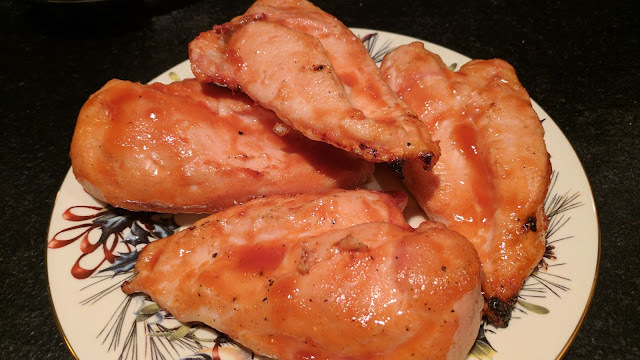 Also, I had some leftover smoked chicken breasts in the fridge, which I cubed up and threw into the salad when someone requested a "meaty" salad. Other veggies would be good too... tomatoes, jalapenos, cucumbers. What have you got, what do you like? 2 cans (15 oz) black eyed peas, drained and rinsed. In a large bowl, add the black eyed peas, cilantro, peppers, onions. Combine well. Add the lime juice, olive oil and spices. Stir and adjust flavors with salt and pepper. Add chicken, if using. Allow flavors to stand and meld for 15-20 minutes before serving. 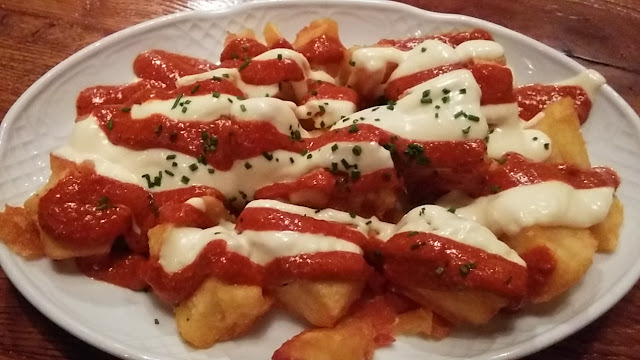 I tried this dish at a tapas bar in Spain. A quiet, unassuming bowl among many other exciting salads, in the top left of the photo below, only some of the bowl is in this shoot. 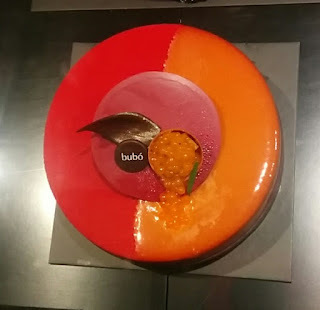 I tried some, because it looked so pretty. I was instantly in love. We'd been wandering all morning in this city square filled with coin, stamp and other collectibles flea market. We'd gotten off our cruise ship early that morning, and frankly after 7 days on a cruise ship, you'd think you'd be full still? 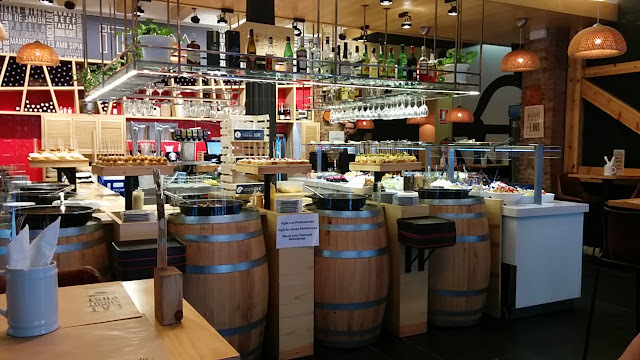 This place appeared to be a chain restaurant, but it was just ready to open and we could see inside to the great looking buffet of tapas, all ready for us to check it out. 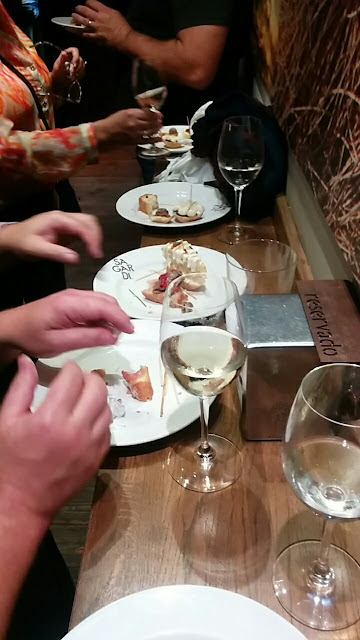 This was a good value and easy for a group to eat so that everyone got exactly what they wanted. Potato tortilla on a slice of bread with a hot pepper, interesting! But, onto the recipe for that salad I talked about earlier! 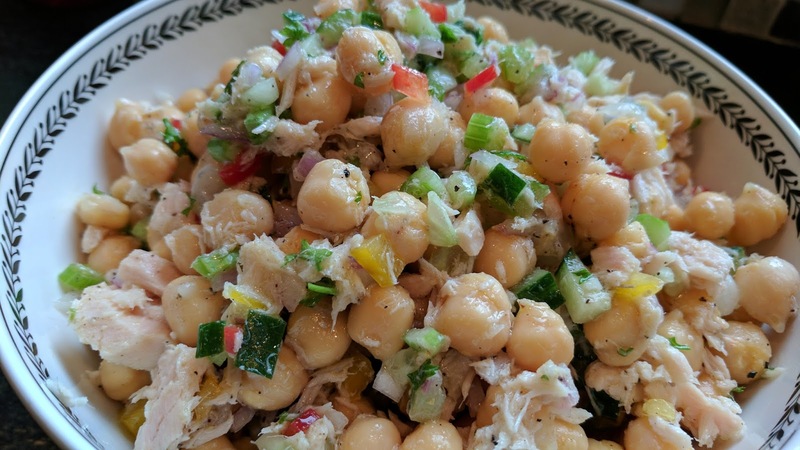 In a large bowl, gently toss together the chickpeas, the tuna, onion, bell pepper, the olive oil, vinegar, chopped parsley and lots of freshly ground black pepper. Add more olive oil, vinegar, or salt and pepper as you like. 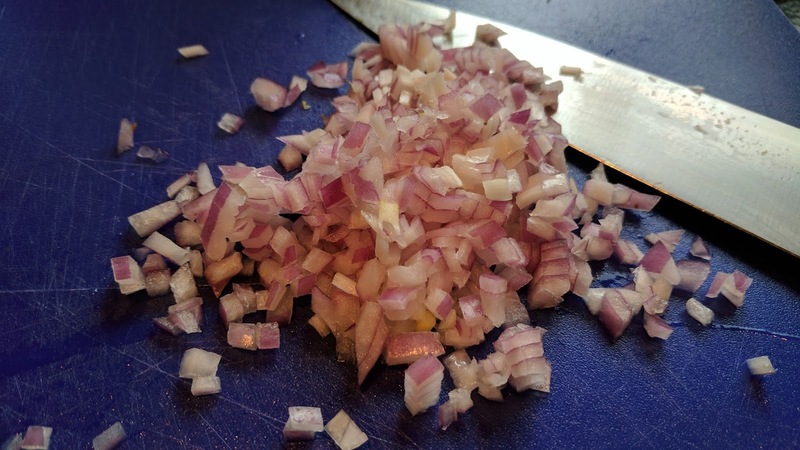 If you think red onions are too strong, try this trick. 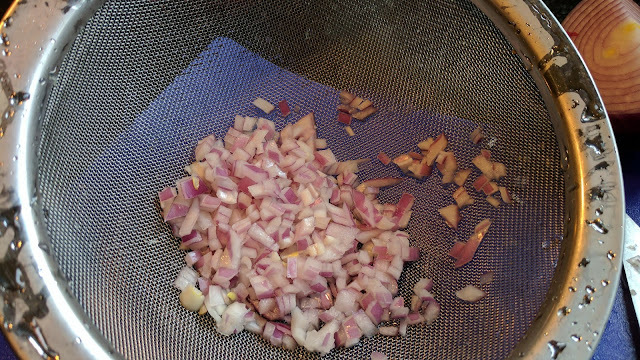 Pour boiling water over the minced onions, drain and add to the salad. This makes them less strong, which many people object to in red onions.